Voracious video appetites in the region raise the platform's optimism about its ad offerings. After grappling with slowing advertising sales and stagnating audience growth, Twitter is pushing its video ad formats and has found early success in Asia. "We’re seeing video become the preferred way in terms of what people are sharing," said Matthew Derella, Twitter's global VP for client partnerships and brand strategy. "From a marketing standpoint, it’s an obvious way to connect premium content and target that to very precise interest, and the market is responding powerfully to that." Consider this: Globally, video views on Twitter have grown 220-fold in the last 12 months. More than three-quarters (78%) of Twitter users in the U.S. watch video content on the microblogging site. But the proportions are even higher in the Philippines (92%), India (91%), Indonesia (86%) and Singapore (83%). There’s been a 400% increase in video consumption in India in the last year. "We continue to see this part of the world as a major growth driver," Derella said. Video accounts for about 40% of Twitter’s global revenue and international business contributes about the same amount. 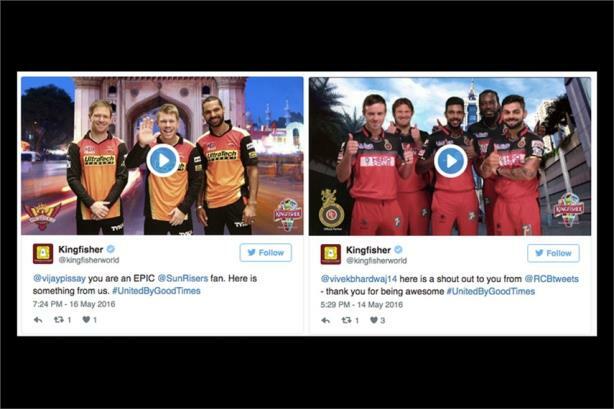 One of the firm’s recent success stories is beer maker Kingfisher, which collaborated with Twitter to co-create a ‘Name Targeting’ campaign during the Indian Premier League, to connect cricket fans with their favourite teams in real time. Kingfisher created personalized videos of all the IPL teams and posted them on @Kingfisherworld as a token of gratitude for fans’ support. The brand made use of Twitter's archival data to bring fans closer to their IPL stars by @mentioning users with videos of the IPL teams they support, personalized with their names. Twitter claims the campaign generated "a significant amount of genuine, organic expressions of love for Kingfisher and the IPL team they sponsor." Over 85,000 people were surprised by these videos on Twitter. The brand saw its daily positive sentiment increase by more than 250% on the days the campaign ran. Nescafe in the Philippines broke Twitter's world record for the number of "unlocks" it received with its Flock to Unlock video campaign. Within two days, the brand got more than 100,000 unlocks, 7.1 million impressions, and 3 billion in potential reach. "This was a campaign that Twitter's brand strategy team partnered closely with the brand from the planning phase, working very closely with the creative and media agency and the client to optimize the campaign," said Parminder Singh, Twitter's MD for Southeast Asia, India, and MENA. First View is the most popular video ad unit in Asia, with brands like Fanta in Japan, Samsung in Australia, and Tata Motors among the top users. Advertisers opting for First View will essentially get the top ad spot the first time a person opens the site, for a 24-hour period. "First View is a great way to reach every user on Twitter to get the first promoted Tweet they see," said Singh. "That combination of reach and conversation is really standout." Twitter is investing in people and projects to work with agencies and brand leaders, Derella added. It plans to launch #GoLive, a series of agency training bootcamps across Asia, bringing together Twitter experts from research, product, and brand strategy. The bootcamps are aimed at educating agencies and brands on live moments and video innovation. More than 20 training sessions will be held with agencies in India, Indonesia, the Philippines, and Singapore between August and September.